The examination of the urine of small animals / pets (dogs, cats, rabbits, guinea pigs etc.) can provide information leading to the diagnosis of disorders and diseases of the urinary tract. - Includes 100 urine test strips, and instructions. The urinalysis can provide information not only about the kidneys and bladder, but the liver, pancreas, and other organs. In addition to helping make a diagnosis, a urinalysis is also helpful in determining a prognosis (a forecast of the outcome of the disease) and response to treatment. 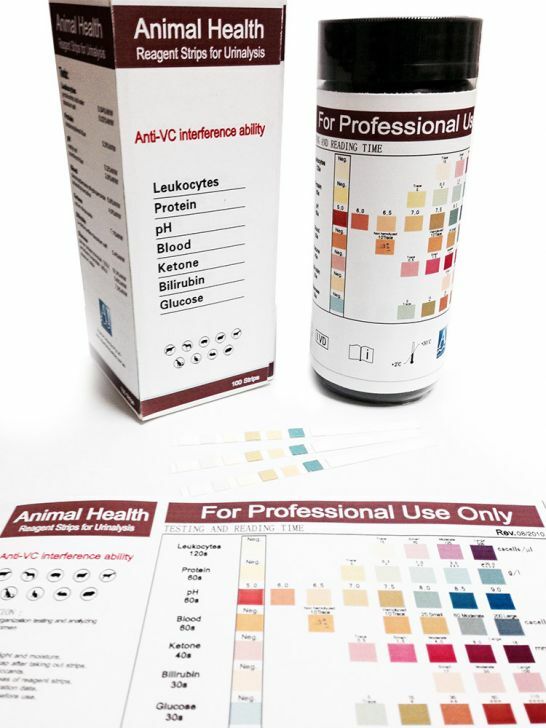 Still, as with other tests, the urinalysis is just a reflection of what is going on in the animal's body during a short period of time. In some instances, the results may be very different in a few days, or even in 24 hours.